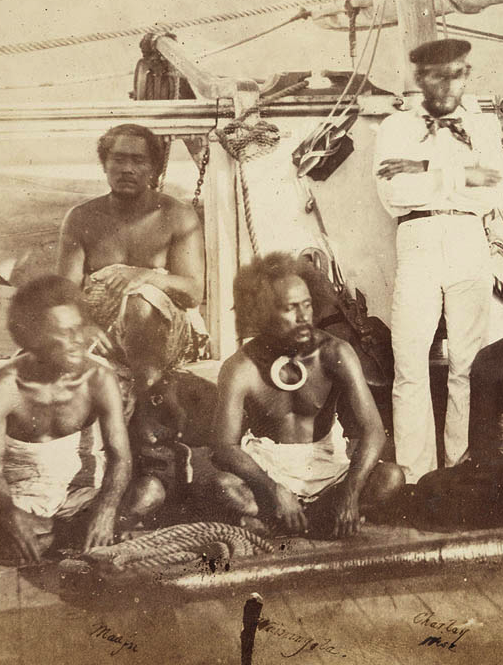 The photo shows Nantucket sailor and trader, David Whippy, a bold and commercially-minded adventurer, who created a Fijian dynasty; myriads of Whippys descended from this Levuka gene-source. He was recorded as married in Fiji 1827. This first David Whippy of Levuka was in Fiji by the age of 25, and died in Fiji, age 69. The first recorded child of his was born 1828. At least 12 children: He had 12 recorded children – and perhaps more, were unrecorded – from at least six partners. 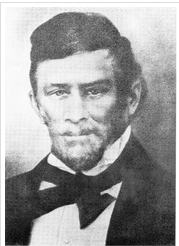 Carol Riley, in her impressively researched family tree reported the first David Whippy in Levuka, was born 15 February 1802, in Nantucket, Massachusetts, USA. His father was David WHIPPY b. circa 1769, d. 1812; and his mother Keziah BUNKER b. 22 September 1770. Family one: A Marriage was recorded 1827, Namara, Tailevu, Fiji, to Adi Tulia. One child was recorded as David (Junior) WHIPPY b. 1828, d. 1867, according to an interview, with William Eason in 1985. Family 2: A marriage was reported but not verified) in to 1831 to “Yunus”. Children were Thomas WHIPPY b. c 1850, d. 17 Dec 1934, Daniel WHIPPY b. c 1852. Family 4: A Marriage was reported around 1836, Methodist, Levuka, Ovalau, Lomaiviti, Fiji to Dorcas DELAUS. the children recorded were Alameda WHIPPY+ b. c 1836; Samuel WHIPPY+ b. c 1837, d. 1910; Kezia WHIPPY+ b. c 1838, d. 6 Jul 1898; Julia WHIPPY+ b. c 1840; Mary WHIPPY+ b. 1842; Sarah WHIPPY b. c 1845; and Elizabeth WHIPPY b. c 1847, d. 2 Aug 1882.